Abandoned carts are a huge issue for any WordPress e-commerce website. Most online stores lose a percentage of their customers at each stage of the order process. You can see this by setting up goal tracking or conversion funnels in Google Analytics for your e-commerce site. As the world’s leading WordPress e-commerce plugin, a solution for abandoned shopping carts in WooCommerce is definitely needed. There are various plugins offering to help with this problem. WooThemes, the creators of WooCommerce, have quite a basic solution. Their Cart Reports extension simply provides data on abandoned carts. It doesn’t take any action to recover these orders, which is a big gap. A lot of WooCommerce store owners therefore look for a third party plugin to recover their abandoned carts. WooCommerce Abandon Cart Pro is one of the more fully-featured plugins. It claims to help WooCommerce website owners to recover over 30% of lost sales automatically. It works behind the scenes, requiring no input after the initial setup. The plugin sends multiple email reminders to your registered customers about abandoned orders. It gives incentives to return and complete their checkout by offering discounts and coupons. 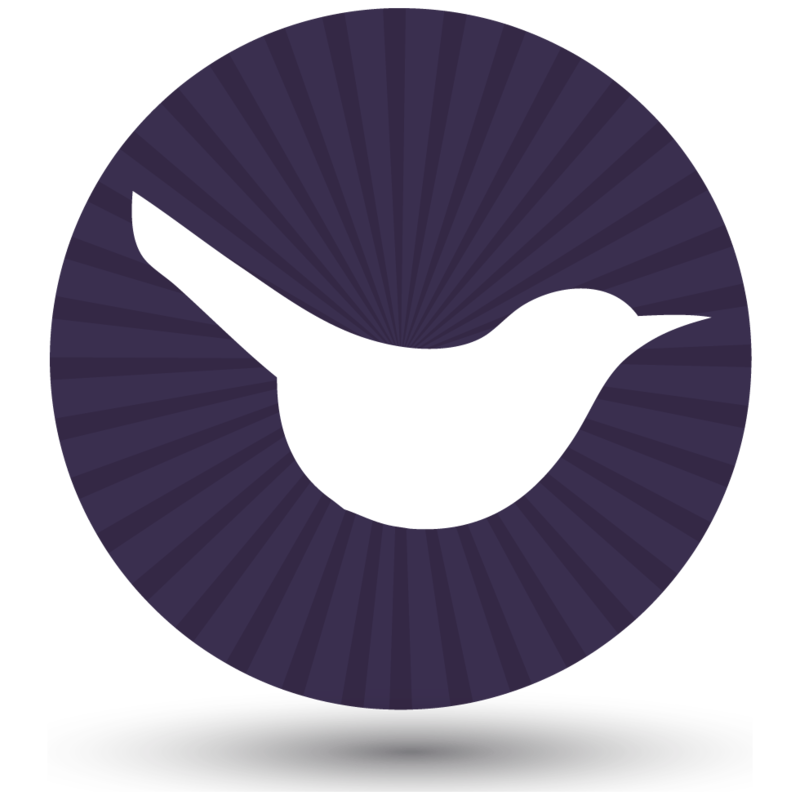 First, I’m going to review WooCommerce Abandon Cart Pro. To provide a balanced review, I’ll also tell you about an alternative abandoned carts plugin which you can read about below. 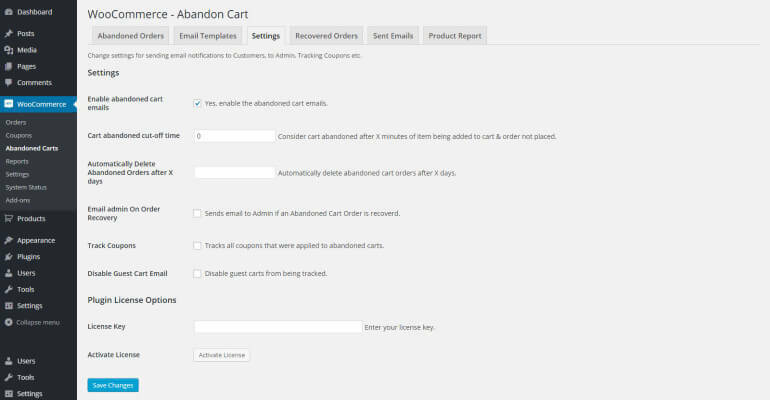 Before we look at a plugin to recover your abandon carts, it’s important to take steps to prevent people from abandoning their cart in the first place. In Shopping Cart Abandonment – 3 Best Practices To Address This Problem, SevenAtoms give good advice on how to prevent abandoned carts. This includes making shipping costs clearer and streamlining the checkout. I regularly buy from e-commerce websites and often add something to my cart just to find out the shipping cost. I then move on to another (cheaper) website. So I can say firsthand that this is a big cause of abandoned carts. In the same article, SevenAtoms talk about sending an email shortly after the cart is abandoned. The developers of WooCommerce Abandon Cart Pro have provided these emails as part of their plugin, as well as numerous other features to recover abandon carts. Let’s look at this plugin now. WooCommerce Abandon Cart – Free or Pro? There is a free version of this plugin – WooCommerce Abandon Cart Lite. This provides a limited version of most of the functionality available in the Pro version and is a great way to try out the plugin before making a commitment. Ultimately, you will probably want to upgrade to Pro to unlock the 3 default email templates and monitor your customers’ behaviour in more detail. However the Lite version is definitely worth trying. We reviewed the Pro version to get a full picture of the functionality of this WordPress plugin. WooCommerce Abandon Cart is easy to install. 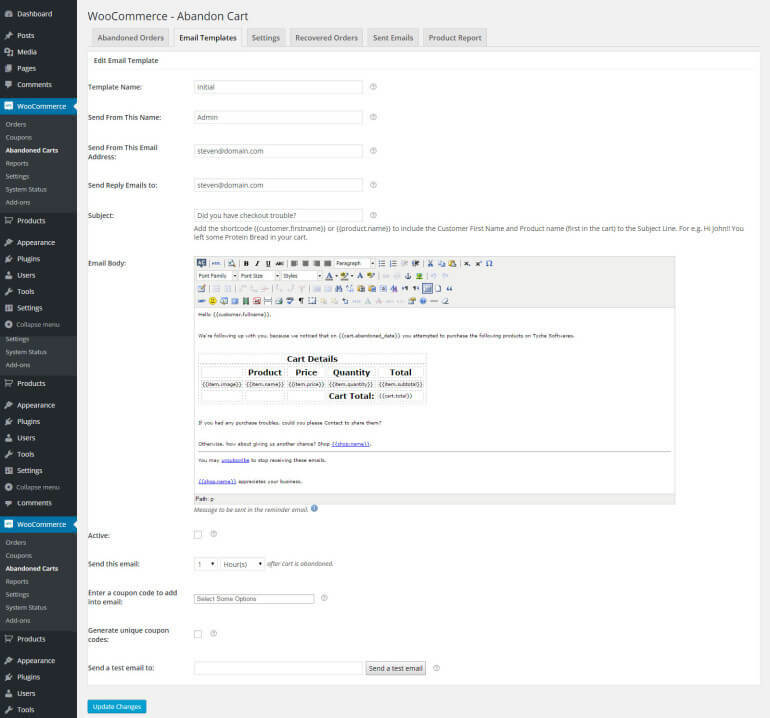 You can easily find the configuration options in the WordPress admin at: WooCommerce > Abandon Carts. I like the way that the settings are integrated with the WooCommerce settings (too many plugins clutter up the WordPress admin with a top level link. Luckily the developers of this plugin haven’t fallen into this trap). It’s a shame there is no ‘Settings’ link on the main Plugins page in the WordPress admin (similar to the link on the WooCommerce plugin itself next to ‘Deactivate’ and ‘Edit’) so that users can immediately go to the plugin configuration options upon installation and activation. I often look here if I’m unclear of where to find a settings page. The plugin documentation is clear, comprehensive and easy to find on the plugin website. This is good as a lot of WordPress themes and plugins bundle the documentation with the plugin files which most people never look at. Abandoned ordered are displayed instantly after a cart is set to abandoned (as determined by the configured cut-off time). This page gives the WooCommerce shop owner an overview of each abandoned order and the option to view or delete it. Once an abandoned cart is created after the defined cut-off period, any modifications to the cart afterwards creates a new abandoned cart. I don’t particularly like this feature because it potentially creates multiple abandoned carts from a single customer. I would prefer it if the plugin tracked cart revisions within the a single abandoned cart, rather than creating new ones. It’s worth noting that the plugin settings page is nicely integrated into WordPress itself. I always respect plugin developers who do this. They’re working with WordPress rather than against it, which is an important principle. It’s always a shame to see settings pages that look completely different to every other page in the WordPress admin, so it’s nice to see the familiar style of the WooCommerce Abandon Cart settings. This is an excellent feature that gives shop owners the option to configure the time before a cart is considered abandoned. This gives great flexibility for the different types of businesses that are likely to use this WordPress plugin. Depending on your product offerings, a different cut-off length may be appropriate. This feature allows a user to set the amount of days the abandoned order is active before it is automatically deleted. This lets you decide on how long you would like to try and convince the customer to carry out their purchase before deleting the abandoned cart. This automatic feature means the website can remain organised and the plugin won’t clutter up your database. It also allows you to focus on the latest orders that are most likely to convert, without leaving a large array of old orders in the system that will likely never convert. An unlimited number of email templates can be created to build a campaign that triggers any number of emails to be sent at specified time intervals after an order is set to abandoned. An intuitive interface allows you to set the length of time (minutes, hours or days) at which emails are sent. 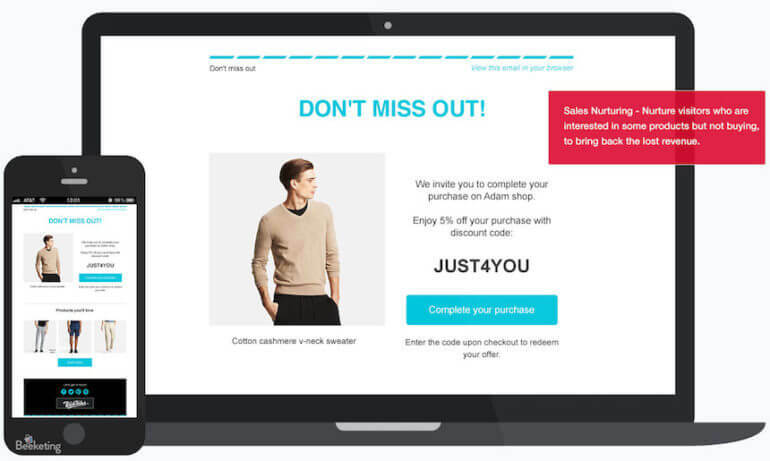 It’s easy to add coupon codes (which can be tracked) to the email, giving a customer an incentive to come back and complete the purchase. There are some conscientious options, such as the ability to use ‘unique promo’ codes that are generated automatically for each customer instead of using the same generic codes for everyone. Detailed tooltips help explain the options, which aids usability and avoids having to refer to the documentation. If you decide to use this plugin, I recommend that you plan your abandoned cart emails as part of your wider marketing strategy, for example to avoid looking spammy or pushy. Create emails that are as personal and relevant as possible. Although the email templating system is nice, a “WYSIWYG” (What you see is what you get) editor is currently being used. It does the job but the plugin could be improved by making it the same as the inbuilt WooCommerce email template system. This would bring consistency for both shop owners and customers. WooCommerce allows you to override their default email templates via the theme and also allows you to use both plain text and HTML emails. They have an API that allows you to add new emails too. Being more robust and future-proof. Consistency in design and layout from all emails sent by your WordPress e-commerce store. This applies to the emails directly from WooCommerce and by Abandon Cart Pro. At the moment WooCommerce emails will look different from abandoned cart emails. Shop owners who are already familiar with WooCommerce may have less of a learning curve when using the plugin for the first time due to their familiarity with the existing WooCommerce email system. There are no mail settings within the plugin, so I assume the inbuilt wp_mail() function is being used. Sometimes this fails and having the option to enable SMTP may be good. This will let users insert the mail server settings for a real email address on their hosting account and domain. This could improve email delivery and solve troubleshooting email delivery problems. In a plugin that sends emails to users, it’s hard to track which emails were successfully delivered. Offering some sort of email delivery reporting would give peace of mind to shop owners. It would also let them know if a delivery problem exists. An overview of successfully recovered orders are displayed within its own tab. An intuitive interface allows users to set a date range to show the number of orders recovered and how much revenue this generated. The plugin offers some interesting reporting. This includes number of times each product was abandoned and subsequently recovered. It tells you how many emails were opened and how many links clicked. We only did a quick test of this feature, but we opened all the emails that we received from the plugin. We clicked through to complete the purchase so these email reports did not update to reflect our activity. More testing of this feature is needed. I like to avoid bloating out WordPress plugins with unnecessary data unless it’s usable and useful. I’m not entirely convinced that the reporting data provided is particularly useful by itself. It may be useful if it was complemented with other data (such as time and date) in a visual graph. For example this may then help to determine the best days and times to trigger emails. It will also help to determine at what times they’re more likely to be opened and most likely lead to a completed purchase. The most important improvement I’d like to see in this plugin is an improved ability to track guest customers. Like most abandoned cart plugins, WooCommerce Abandoned Cart Pro only recovers abandoned carts from customers who are registered and logged in. This is clearly stated on the plugin website. Given that not many people will register before completing a purchase, this means it is mostly useful for existing customers. Although guest carts are tracked, users don’t insert an email address until quite late in the WooCommerce checkout process. This reduces the opportunity to contact guest users. Abandoned carts from guests are almost certainly a bigger problem than abandoned carts from registered users (who have had previous dealings with the website). This would greatly extend the reach of the plugin. Introducing a ‘newsletter subscription’ overlay popup or similar around the website would capture people’s email addresses earlier. This would improve the chances of capturing guest data. The guests’ email addresses could then be integrated with the Abandon Cart plugin, allowing the plugin to email these guests as well as registered members. Integration with third party re-marketing systems such as Google Re-marketing also help to solve this problem. This may help store owners reach out to guest abandoned carts where a user didn’t insert their email address. These third party systems already do most of the work in showcasing the abandoned products. Integrating with the WooCommerce Abandon Cart plugin would make it easier to email these users. It would also provide incentives to complete their order. 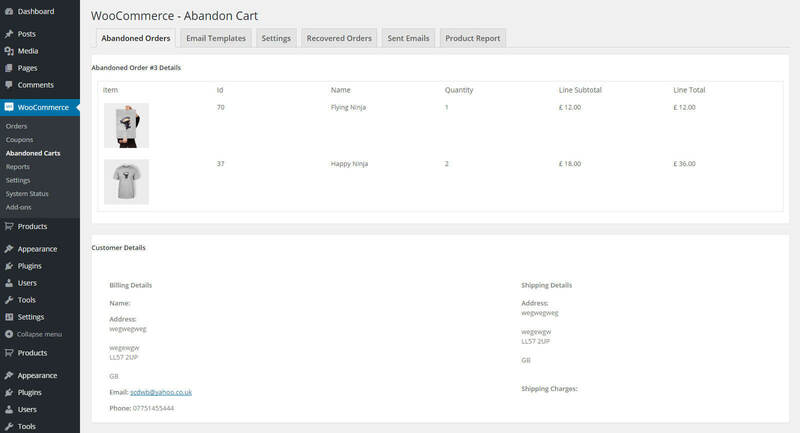 The WooCommerce Abandon Cart Pro plugin is designed to let you email users to encourage them to complete their order. It does this very effectively. Another potential use for the plugin is to contact customers to request feedback about WHY they abandoned their cart. These are the people who can give you the best possible information about how to increase your sales. After all, they nearly make a purchase and then dropped out at the last minute. You can feed the results back into improving your website usability and product offering. This might also be a nice way to email people without looking too pushy. You’re contacting them under the guise of asking for help instead of reminding them to complete their order. (Although it will hopefully have the same result!). While WooCommerce Abandoned Cart Pro can reduce the cart abandonment rate for your online store, but as I mentioned earlier, some of the features are limited. It’s true that you can easily set up cart recovery emails for all abandoned users with no time, but what if these customers never open your emails? I bet that you’ll need a stronger solution than just sending emails. WooCommerce Marketing Automation by Beeketing aims to do that. 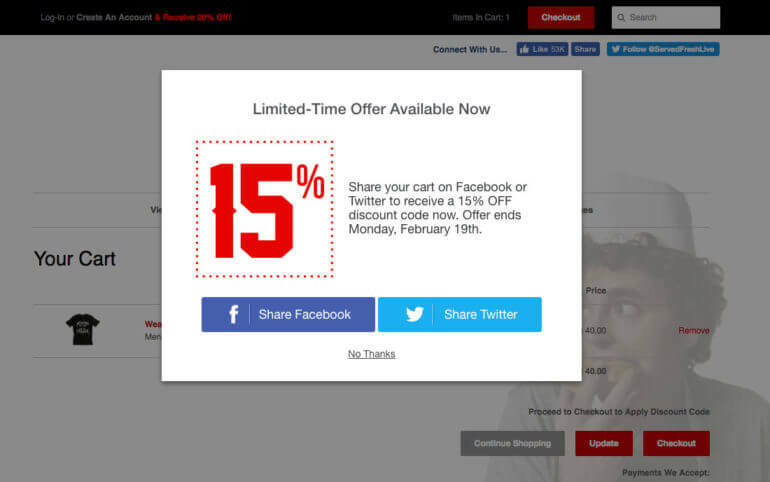 This plugin helps you deal with abandoned carts by adding tweaks to your website, creating a unique shopper experience with different types of incentive offers. It also allows you to create email recovery campaigns that are instantaneously activated, once a cart is abandoned. These emails can be created and scheduled in campaigns at the back-end of the website, which are then sent out at the specified intervals. What is worth noticing here is that it also lets you sweeten the deal – by giving people a discount coupon via email to help provide incentive for their return. All in all, WooCommerce Marketing Automation by Beeketing is a well thought out plugin that could save you tons of time and money. If you want an all-in-one, modular solution to recover abandoned carts for your WooCommerce store, definitely check it out as an other excellent option to consider. If you have a WordPress WooCommerce website and are concerned about abandoned carts then one of the plugins I’ve discussed today can probably increase your sales. These plugins don’t just track your abandoned carts. They actually let you email these lost customers and send them incentives, which is a huge bonus compared to some of the other plugins available. It’s hard to think of any WooCommerce website that an abandoned plugin wouldn’t benefit, as abandoned carts are a global problem for any e-commerce store. Executed correctly, this type of plugin could make a big difference to your sales. I don't know how it feels yet and what result I could get If I used the plugin. It all needs to be checked and tested in order to see how it works for different kinds of sales. A couple of my friends are testing it, well we'll see. Thank you for sharing this review. Thanks Jay, I'd be interested in how you and your friends find the plugin for different types of sales. It would be great to know your test results. Do let us know if you need help with anything. Good insights. I heard our technical manager mention this but none of us could follow through. This article simplifies it. Thanks Katie. Hi, what security issues are you referring to? The security issues pointed out by the Wordpress review team were fixed & a new update ( v 1.9 ) was released. The issues were relating to the use of the prepare() for mysql queries. If you update to the latest version, the fix would be applied. The plugin was taken off from the wordpress.org repository & after our modifications, it was reviewed again & then made live on wordpress.org. Thank you for this review, I have used the lite version for a few weeks, and I like what it does. I do wih that it couls capture guest carts too, that would have made it perfect. I agree that capturing guest posts would be perfect, but if the customer hasn't entered their email address then this isn't really possible as there's no way to contact them! I suppose it could be integrated with something like Google AdWords Remarketing so that a cookie is placed on the customer's browser and an advert for your site will appear when they visit other sites - that would be a neat way to remind them about you even if you don't have their email address! would this work with Woocommerce Bookings? When a cart becomes an abandoned cart, will then the capacity for that block again available on the front end? Hi Frank, yes it works with any type of WooCommerce order. I'm not 100% sure but I believe that the block will only stop being available when the order is completed, and is not reserved when someone simply adds it to their cart - which means that if the cart is abandoned then the block will still be available. It's worth testing this to make sure. Thanks, Katie for your helpful review. I was wondering if maybe you have had the chance to try out their pro version and have some feedback since I am currently considering the pro version and would appreciate if somebody could give me some usage experience. Hi Vincent, no I haven't tried that. We use Jilt on our own site and would recommend that, but I don't know any free ones. If you try it, feel free to add your comments as to how you get on! I've tried the 2 both: the Woo Abandoned Cart plugin and Beeketing. They have a lot differences. Woo abandoned cart works from the back-end. Beeketing works on both sides plus a lot more features. Thanks for the helpful review.